Over the summer, Dr. Wilder and I have set up camp in Drexel University’s Expressive and Creative Interactive Technologies (ExCITe) Center in Philadelphia to work on the Isomer Project: a digital humanities research project aimed at teaching computers to listen to music sensitively. Our goals for the summer are to develop both quantitative and qualitative aspects to Isomer’s ability to listen and identify descriptors for music. During my first day at the ExCITe Center, Dr. Wilder showed me examples of production music, or music used in advertising. Upon listening to production music on its own for the first time, I was surprised at how formulaic it sounded. Despite appearing musically clichéd, advertising music provides the perfect means to understand how emotion is transmitted in music, because it is designed to elicit specific emotions in order to create associations with a specific product. Although it was entertaining to listen to the differences between tracks, we then began to analyze exactly how this music is able to achieve its desired effect. We started our analysis with mood keywords, such as “tension” and “romantic,” associated with each track. Dr. Wilder wrote a program to automatically extrapolate the keywords associated with each track. To better understand the relationships between the keywords, I researched social networking theory in order to navigate the massive amount of data. I found Mark Granovetter’s recently republished article “The Strength of Weak Ties” (1973) extremely useful in understanding how units relate to one another. In the relatively small sample of tracks we used (around 2,000) we found a surprisingly limited number of unique keywords, but an incredibly dense network of connections. I applied several sorting and ranking algorithms intended for social network exploration with the goal of finding the most popular keywords. Some of these included descriptors such as “vocals,” “pop rock,” and “movement.” From there, we chose several prominent keywords, and developed them into “mood-trees.” For example, one of our root words was “electronic.” Tracks that were electronic had several mood branches, such as “electronic-dark” and “electronic-percussive,” each with their own distinct sound and usages. Eventually, we hope to have Isomer listen to and generate its own music. Dr. Wilder has been an incredible mentor this summer. One of the most interesting and valuable skills I learned while working with him is the way he ties cross-disciplinary elements into our project. With each task, a related field such as business, programming, and music cognition will intersect with our work – and when that happens, he takes the time to explain exactly how. This experience is more like a real-world collaborative business venture than just a research position in a lab, and I am incredibly grateful to have this opportunity. This entry was posted in Uncategorized on August 21, 2013 by kochism. 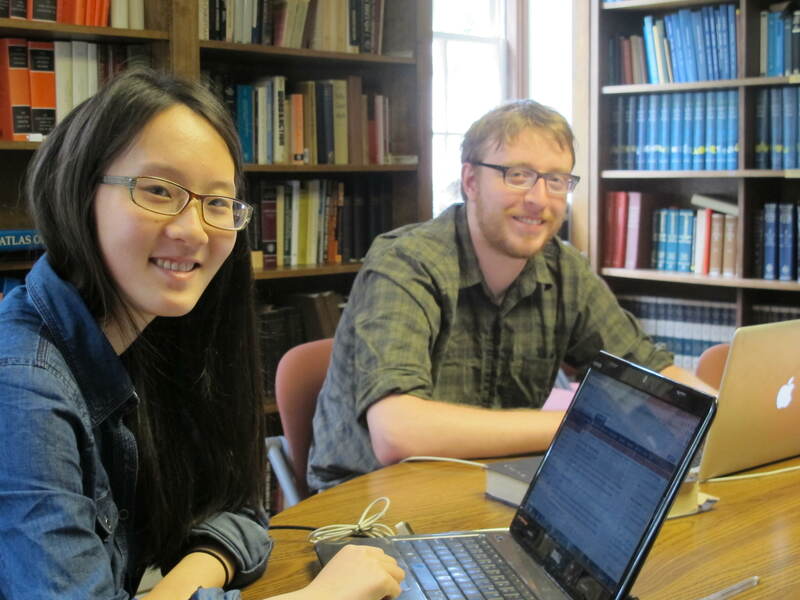 Summer Research Assistants Qingyu Wang and Dan Plekhov, both of the Dickinson class of 2014, have just completed an eight week stint working on the Dickinson College Commentaries, and their accomplishments have been substantial. 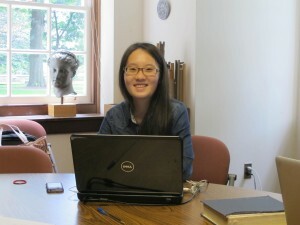 Qingyu is a Computer Science and Economics major from Nanjing, China, and Dan is a Classical Studies and Archaeology major from Glen Rock, New Jersey. They were paid a stipend and given housing through the Christopher Roberts Fund for classical studies at Dickinson. via the Pelagios Project. 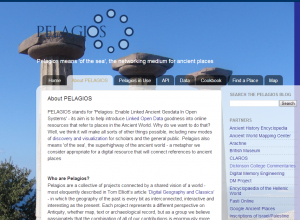 Pleiades is the main hub online for linked data about the geography of the ancient Mediterranean. More than a map or gazetteer, it is a platform for comprehensively linking data from disparate sources about ancient places. DCC is now one of many digital projects whose geographical data (in our case, notes about specific places mentioned in the texts we cover) is automatically fed into Pleiades. This magic happens through the Pelagios Project, which is a third party that funnels data into Pleiades so the linkages happen without further human intervention. On our end what needed to be done was to create a single file that listed all of our geographical annotations. We already had Google Earth maps made last summer by Merri Wilson, that contained placemarks with all places mentioned in two of the existing commentaries, each placemark annotated with Pleiades URIs (unique identifiers). The existing Caesar map did not have the Pleiades URIs, and all the linkages in the other commentaries had to be checked for errors. As an Archaeology and Classics major, Dan was perfect for this job, which required a good knowledge of ancient geography, Latin, Greek, and solid research skills. Another aspect of that process, in a sense the reverse of it, was the automatic channeling of data from Pleiades into DCC, via the addition of thumbnail pop-ups on the names of places mentioned in the notes fields. As of this summer, when you mouse over such a linked place name in DCC, a thumbnail with a small map pops up, with the link to Pleiades. The beauty of this is that one does not have to navigate away from the text to get an idea of where roughly the place is; but at the same time, Pleiades is only a click way. Qingyu and Ryan Burke made this happen, using a bit of css code created by Sebastian Heath for use in his ISAW papers. So now DCC is comprehensively linked with Pleiades, and we owe a big debt of thanks not just to Dan and Qingyu, but to the folks at Pleiades (Tom Elliott and Sebastian Heath) and Pelagios (Elton Barker and Rainer Simon). Dan has extensive training in ArcGIS, so I took advantage of that to have him create some new maps for the Caesar commentary. 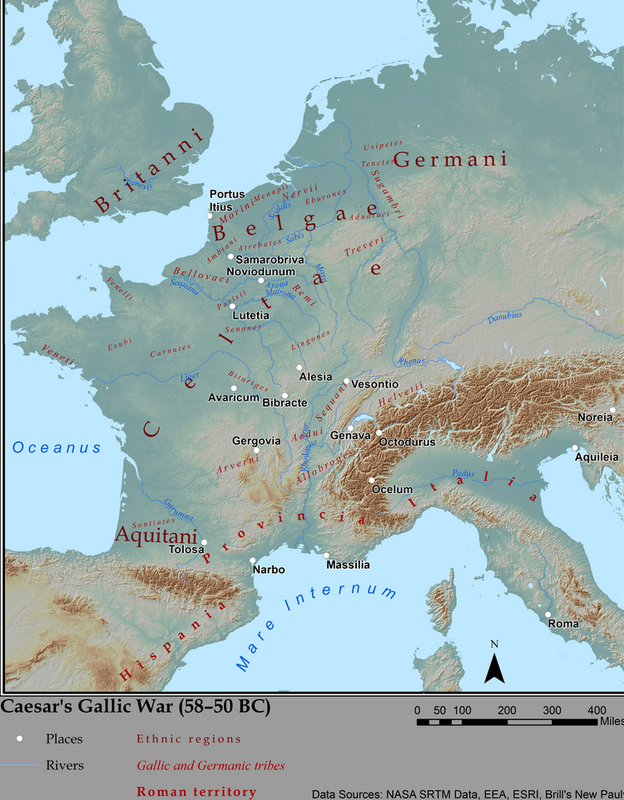 The showpiece is his beautiful new map to go with BG 1.1, the overview of Gaul. 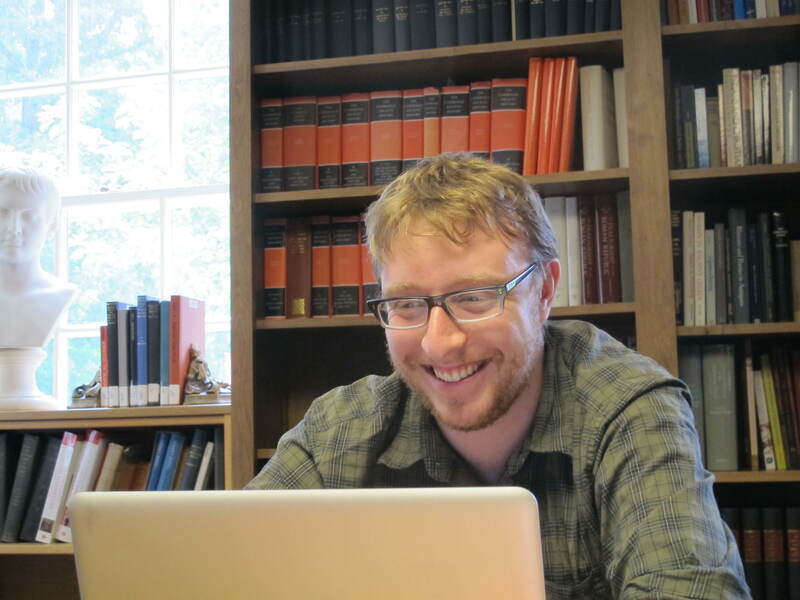 We were also fortunate to get some advice from Caesar expert Andrew Riggsby at the University of Texas, who has written extensively on the representation of space in Caesar. Dan himself did substantial research on geography in Caesar, reading through all of the BG up through Book 6, and making a comprehensive list of places and ethnic names mentioned for future inclusion in an expanded version of our Caesar commentary. He also used ArcGIS to update and beautify several of Antonio Salinas’ strategy maps. 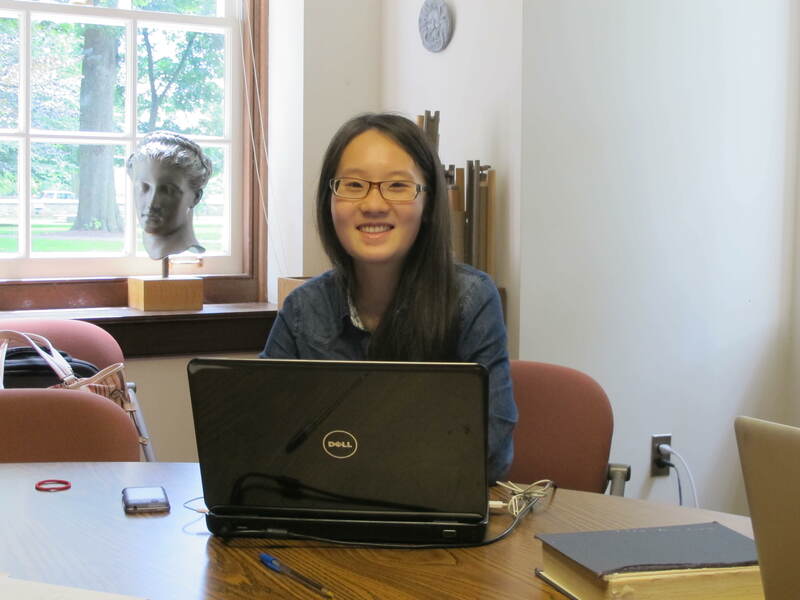 Meanwhile, Qingyu was working on her next major project, creating relational database versions of the DCC Latin and Greek Core Vocabulary lists. Derek Frymark (’13) provided spreadsheets that presented the lists in table form. Qingyu hashed out exactly what needed to be done to create the database in Drupal. She miraculously mastered the inner workings of Drupal in virtually no time, imported Derek’s spreadsheets, and the result is the attractive, flexible interface you can see here (Latin) and here (Greek). This represents a major improvement to a popular and useful feature of our site, and the feedback from users has been great. After finishing his mapping efforts, Dan entered the Greek vocabulary lists into our forthcoming site on Lucian’s True Story, the first known piece of science fiction. These lists had been initially created by Evan Hayes and Stephen Nimis for their print edition, but had to be adapted for our format. He then moved on to the preparation of our Callimachus Aetia site, which as you can imagine is a very complicated endeavor due to the fragmentary nature of that text. Just figuring out what we have and don’t have as a legacy of Stanford University’s Aetia site begun under the direction of Prof. Susan Stephens has been a real chore. 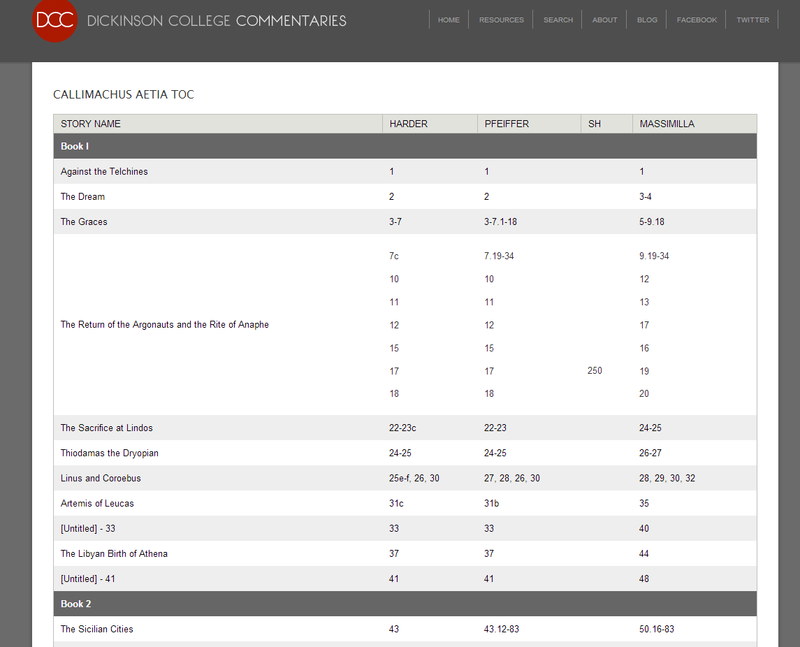 Dan has created a new table of contents which, when it goes live, will be an excellent way to see the work as a whole, and to navigate within the text. Dan has been carefully checking everything on the site against the best scholarly editions (Harder, Massimilla, Pfeiffer, D’Alessio), making sure that the formatting is correct, and that the TOC accurately reflects what we are including on the site. He has also helped me to make innumerable judgment calls about what fragments are actually legible and thus to be included on the site, as opposed to so fragmentary as to be for all practical purposes illegible. Qingyu’s third major task, and the most challenging as it turned out, was creating our own instance of Allen & Greenough’s Latin Grammar. We link out to A&G at Perseus at the moment, but for various reasons we really need to have our own copy on our servers. 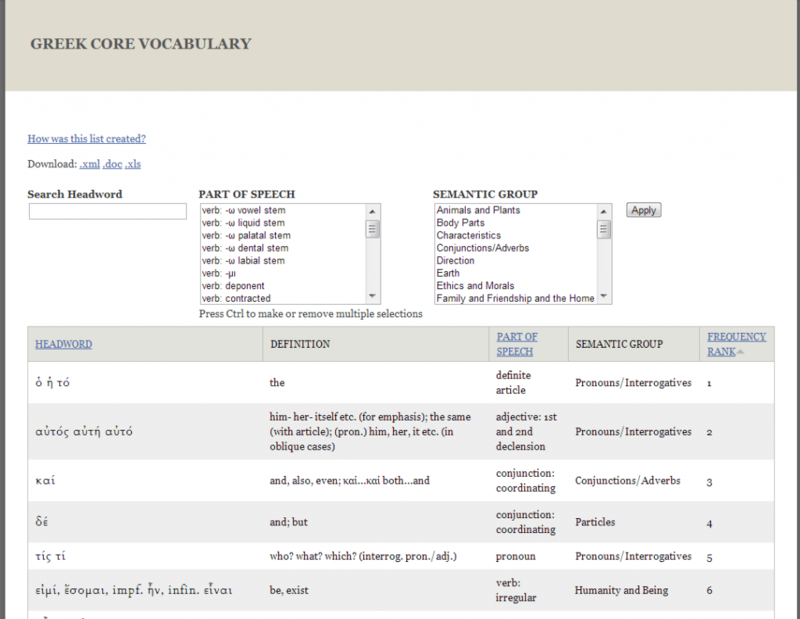 We view the navigation of Allen & Greenough via the table of contents as a temporary stopgap, and plan in the future to create navigation via Allen & Greenough’s Index of Words and Subjects (which is the way most people actually consult the book). But the index has evidently not yet been digitized, and is not part of the XML file. So stay tuned for that. In the long run we would like to have a whole stable of such reference works. My highest priority at the moment would be digitizing Goodell’s Greek grammar. But that’s a project for another summer! All these things sound fairly straightforward in retrospect, but they took a great deal of skill, hard work, and creativity on the part of Dan and Qingyu. This summer has been an experiment and an adventure, and in my view a highly successful one, thanks to their outstanding efforts. I am so grateful to have had the chance to work with them, and I believe that the future holds great things for them. This entry was posted in projects and tagged Dickinson College Commentaries on August 13, 2013 by Chris Francese.